She already debuted a fresh-faced appearance at a photo-call this morning to which she arrived to looking glowing and wrinkle-free. 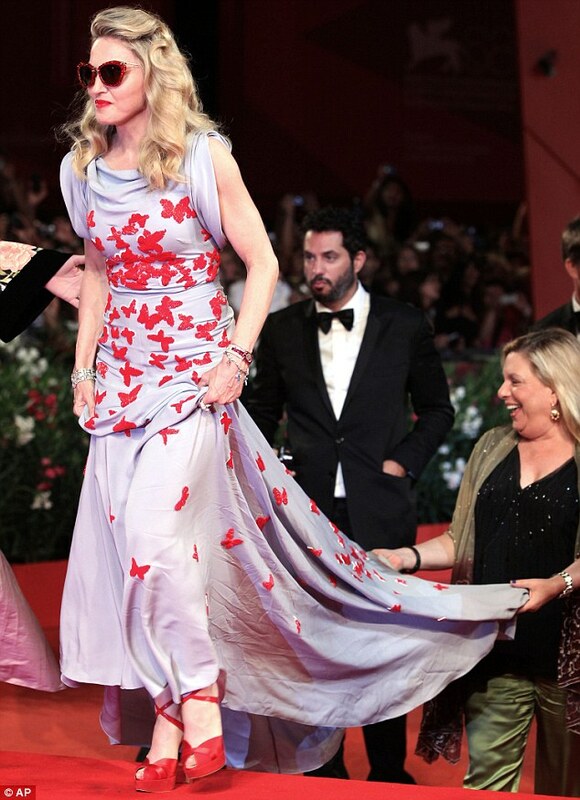 But Madonna's metamorphosis into a youthful butterfly was complete hours later, when she fluttered around on the red-carpet for the premiere of her directorial début W.E, at the 68th Venice Film Festival. The 53-year-old looked ravishing in a floor-length dove-grey gown adorned with red butterflies, created especially for the star by Italian designer Vionnet. The singer put on a grand entrance in the gown, which she paired with sky-high ruby red stilettos and a matching swipe of Scarlett lipstick. And despite the darkness, Madonna slipped on a pair of glitter red-rimmed sunglasses for an added dramatic effect. Adorned with diamonds, the stunning star wore her hair in an old-Hollywood style curl. Ever the social butterfly, she chatted and posed with Australian actress Abbie Cornish, who looked gorgeous in a graduated strapless purple Ateliar Versace and British star Andrea Riseborough, who was princess-like in a lemon Christian Dior Couture sensation complete with intricate beading on the tulle skirt. Both the women star in Madonna's second directorial debut. She also caught up with one of the male stars of the film James D'Arcy, who looked handsome in a black tuxedo. Earlier the mother-of-three arrived in a speed boat to the cheers of hundreds of fans. Flanked by security, she was lead to the red-carpet with one of her assistants, who helped her with the train of her dress. After posing for hundred of photographers in the press line, the star settled into her seat inside the auditorium to watch the film. The singer first appeared as youthful as ever as she arrived at a photocall to promote W.E. that morning. Her complexion was glowing and despite her advancing years, amazingly line-free. The singer-turned-director is apparently a fan of innovative beauty treatments including human placenta facials. But despite these extreme measures, she has said she is opposed to the idea of going under the knife. 'I am what I am. And I don’t like the idea of someone putting you to sleep then taking knives to you,' she has said. Instead, the youthful-looking star credits Kabbalah for helping her to focus on inner rather than outer beauty. She also maintains her lithe figure with a rigorous daily exercise routine, which lasts up to two hours, and a strict macrobiotic diet. She attended the photocall earlier at the Palazzo del Cinema to showcase and talk about W.E. She wore a demure black and white outfit with a cross around her neck and several on her bracelet, and was photographed posing on the red carpet with actors James D'Arcy and Oscar Isaac. 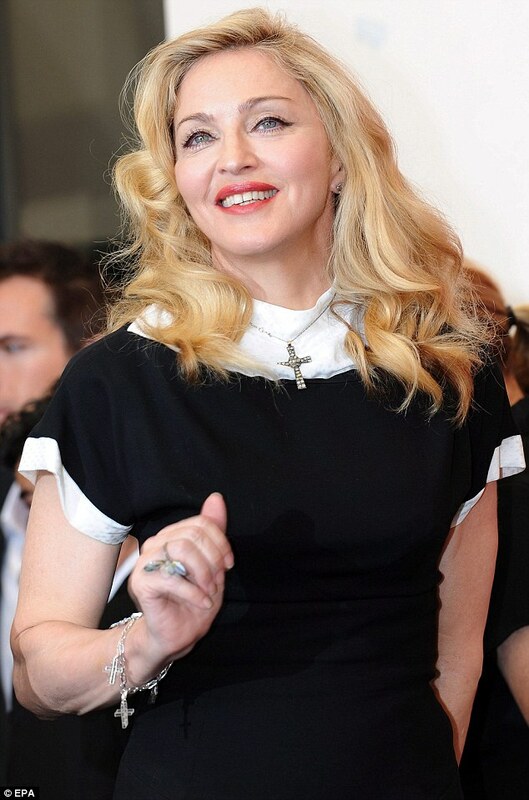 Madonna arrived in Venice the night before and managed to cause quite the stir. She jetted in with a huge entourage but her family and young boyfriend were nowhere to be seen. The youthful star, who has taken a second stab at directing, was seen putting on her sunglasses as soon as she saw the waiting photographers and also tried to guard herself with a black umbrella, even though it was clearly night time. Wearing a pair of black wide-legged trousers and a checked shirt, the Ray Of Light singer was carrying rather large hand luggage, as were those who accompanied her. They soon boarded a boat with their mountain of bags and were taken to the Hotel Palazzo Bauer. The pop star's new film is a drama loosely based on divorcee Wallis Simpson, whose relationship with Britain's King Edward VIII led to his abdication in 1936. Her first film, Filth And Wisdom was released in 2008 but didn't go down as well as the singer would have hoped, so her appearance in Venice is one of importance as she hopes to blow critics away with her second effort. The title of the film is said to stand for the initials of the two main characters, Wallis and Edward. Ms Simpson became the Duchess of Windsor when King Edward VIII renounced the throne and married her. But fitness fanatic Madonna, has cleverly given the film a modern twist, probably hoping that this will hold her in better stead for praise rather than negative press. The film's Royal Family storyline runs parallel with a modern day equivalent following an unhappily married New Yorker named Wally Winthrop. The pop queen herself recently clarified that the film is about a woman's journey and not about the Duchess' life. Instead, the Duchess would act as the woman's spiritual guide. The star says the success of the Oscar-winning The King's Speech also gives audiences a point of reference for her new film, W.E. 'I view the success off that film as laying the ground work for my film,' she said in her press conference today. 'There's a little bit of history, and a little bit of knowledge. We are not starting from a blank slate.'. And it is with those two divorces from the after-mentioned men that make the singer best suited to tell the story of the two-time American divorcee. Even Madonna admitted that were similar parallels with her and Wallis. 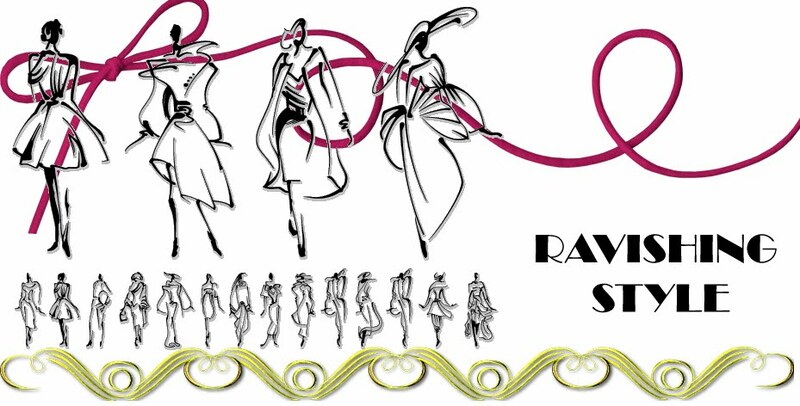 She said that they have common traits, such as both being Americans married to Brits, a shared love of fabulous clothes and a sense of adventure. But most of all, the singer said she could relate to being limited by fame and notoriety. 'I think once you become famous, you have to pretty much relinquish the idea that people are going to see you for who you are, or look beyond the surface of things,' she said.